The contagious period of the common cold is longer than many people believe, but taking a few precautions will significantly reduce the risk of infection. According to McCoy (2004), there are a number of different viruses responsible for the common cold, with rhinoviruses causing approximately 50% of all infections. About 95% of all those exposed to rhinovirus strains they haven’t previously encountered will become infected, and three-quarters of those who have been infected will come down with colds. Although it varies from one viral strain to the next, on average, a cold is contagious the day after the person has been infected, but symptoms usually take 2-3 days to appear, and the contagious period can last until symptoms have completely abated. This means that many people will be contagious without showing symptoms. A person who is coughing and sneezing regularly is more likely to send infectious matter into the air and onto surrounding surfaces. Even if the infected person covers her mouth or nose while coughing or sneezing, if she doesn’t wash her hands afterward and touches a surface, she can leave the virus on it, where it can live for up to 3 hours. Avoid crowds – The more people there are in an area, the more likely it will be that one or more of them are infected. Don’t touch your mouth, nose, or eyes – Touching your face, particularly after touching stairwells, doorknobs, and other public surfaces or engaging in physical contact with others (i.e., shaking hands), is the easiest way to catch a cold. Disinfect surfaces – Cleaning objects with a virus-killing disinfectant is a good idea when there are infected people in the vicinity. There are commercially available disinfectants, though a solution of 1 part bleach/10 parts water will also kill viruses (some surfaces can be damaged by bleach, so use with care). Keep your hands clean – Wash your hands regularly with soap and water, especially after shaking hands and riding public transportation, and before eating. There is no need to use antibacterial soaps; colds are caused by viruses, not bacteria, so antibacterials won’t prevent them and antibiotics won’t cure them. If soap and water aren’t available, alcohol-based hand sanitizing gels can be used, though hand washing is more effective. Exercise regularly – Research shows that those who engage in regular exercise are less likely to suffer from colds. Eating a healthy diet with plenty of fruits and vegetables is also beneficial for keeping immune function strong. Avoid smoke – Smokers and those exposed to second-hand smoke are more likely to come down with colds, and they experience more severe symptoms when infected. Be friendly – Research suggests that those who are more sociable are less likely to come down with illnesses, perhaps because social support enhances immune function by reducing stress. Be kind to yourself – Stress is hard on the immune system. Showing yourself a little compassion and pampering when you need it may reduce the likelihood of illness. While it’s possible that extreme temperatures may stress the body, adversely affecting immune function, they don’t actually cause contagious illnesses on their own. Colds are caused by viruses, and they spread through physical contact with infected individuals or surfaces those individuals have touched, or through close proximity to those who are coughing and sneezing. Spending time outside in winter won’t cause a cold – in fact, it may even reduce the risk, as fewer people tend to be outdoors, thus reducing the likelihood of interacting with an infected person. The myth about cold weather causing colds likely arose because people are often shut inside together for long periods of time when the weather is bad, and close proximity increases the likelihood that the cold virus will be transmitted. While many swear by vitamin C as a cold prevention measure, research indicates that it’s only likely to prevent colds for those whose bodies are under stress, such as athletes and soldiers working in extreme climates. 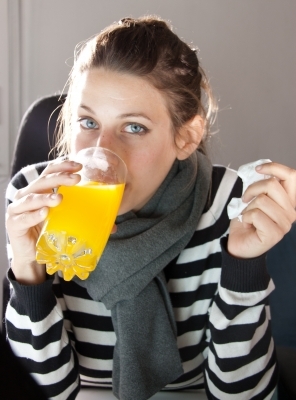 However, taking vitamin C regularly may reduce the severity or duration of colds. For more health articles, visit the main Mind-Body Health page. Bensenor, I.M. ; Cook, N.R. ; Lee, I.M. ; Chown, M.J.; Hennekens, C.H. ; Buring, J.E. ; & Manson, J.E. (2001). “Active and Passive Smoking and Risk of Colds in Women.” Annals of Epidemiology, 11(4): 225-231. Langcuster, J., Alabama Cooperative Extension System. (25 March 2004). “Antibacterial Soap: Useless and Maybe Even Self-Defeating, Expert Says.” ACES.edu. McCoy, L. (2004 August). “Rhinovirus: An Unstoppable Cause of the Common Cold.” The Science Creative Quarterly, Issue 4. O’Connor, A. (2007). Never Shower in a Thunderstorm: Surprising Facts and Misleading Myths About Our Health and the World We Live In. New York: Henry Holt and Company. Schoenstadt, A., MD. (15 July 2008). “Common Colds.” Cold.emedtv.com.